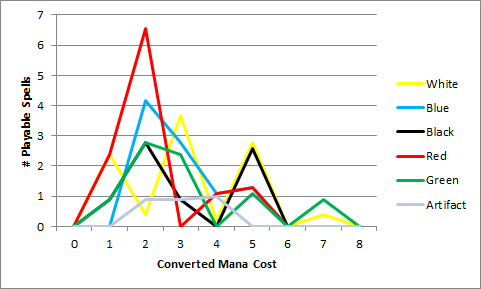 The charts below show the converted mana costs (CMCs) of playable creatures and spells, respectively, by color. (Raise the Alarm, Triplicate Spirits, and Feral Incarnation are counted as creatures rather than spells.) Playable spells are those that I’ve previously evaluated as bombs, exceptional, or good; some of those evaluations have been updated after analysis in subsequent posts. The y-axis of the chart shows the expected number of playables of that color and CMC in an 8-person draft, and weights commons, uncommons, rares, and mythics by the expected number of copies of each in a draft. The charts don’t account for convoke, so white and green spells will appear more expensive than they are in practice. There are 3 things I want to examine. How many playable 1-2 mana green and blue creatures can we expect to see in a draft? We can combine this information with that from last week’s post to determine how good the various creature reuse spells are. An 8-person draft will, on average, have 3 1-mana (all green) and 7 2-mana creatures (4 green, 3 blue) that fit this bill. Assuming that there are 3 drafters at the table in each color, you can expect to get 1 playable 1-mana creature and 2 playable 2-mana creatures, which is not enough to consistently play Invasive Species on turn 3 or Roaring Primadox on turn 4. Both cards do offer opportunities in the long game by allowing you to recur Frost Lynx, Kapsho Kitefins, Living Totem, Satyr Wayfinder, Shaman of Spring, and Reclamation Sage, but Magic 2015 seems like a fairly fast format so far, and so Invasive Species and Roaring Primadox are probably best relegated to the sideboard and brought in against slower decks where you have to grind out card advantage. Peel from Reality and Quickling are still both excellent, since they can be used at instant speed to save your creatures from removal. Is there a glut of good creatures at 3-mana? I have had a couple of drafts so far that have been heavy on 3-mana creatures, especially when playing black, but am not sure whether that is typical in this format. From the chart on the left, we can see that blue certainly has a plethora of good 3-mana creatures, but this is not true for the other colors. If you are drafting a U/X deck, you might want to pick 3-drops a little less highly. Conversely, black decks should prioritize 2-drops. Looking at (non-creature) spells, we see that red has a large number at 2 mana, as does blue to a lesser extent. Similarly, white has a fair number of spells at 3 mana. 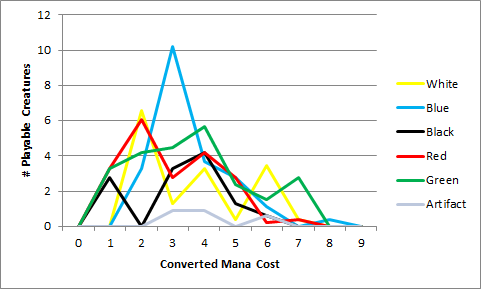 Do any color pairs have mana curves that fit together particularly well? White and red both have a fair number of playable 2-drops and fewer 3-drops, while blue and black have fewer 2-drops and more 3-drops. W/R decks in Magic 2015 tend to be aggressive while U/B decks tend to be controlling, so it may seem that these colors don’t fit well together. However, a fast start from a red or white deck backed up by Frost Lynx has the potential to be quite devastating, so it might be worth considering W/U, W/B, U/R, and B/R decks.